Psalm 70 is a brief prayer that David appears to have composed somewhat frantically in a situation of immediate danger. 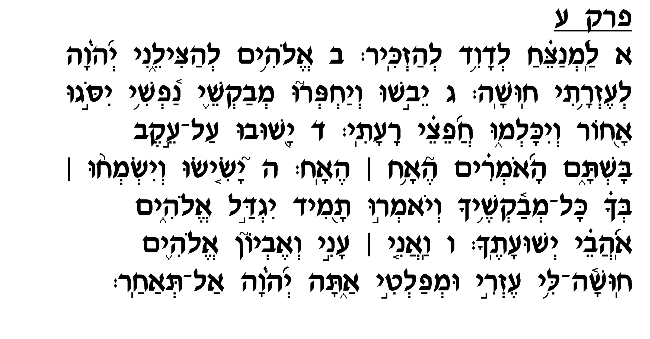 The Radak speculates that David wrote this prayer as he fled from <?xml:namespace prefix = st1 ns = "urn:schemas-microsoft-com:office:smarttags" />Jerusalem during the revolt launched by his son, Avshalom. The "frantic" tone of this prayer is manifest not only in its brevity and succinctness, but also in the term "Husha" ("hurry") which David employs twice in appealing to God for assistance (verses 2,6). Furthermore, he emphasizes in the final words of this prayer – "Al Te'ahar" ("Do not delay!") – that he is in desperate need of immediate salvation. David here prays for the downfall of not only those who actively seek his destruction and attempt to harm him (verse 3), but also those who celebrate and exult in his suffering (verse 4). David's adversaries seized the opportunity presented by Avshalom's revolt to mock and scorn him, and they rejoiced over his humiliation. Indeed, we read in the Book of Shemuel II (chapter 16) of Shim'i Ben Gera, an opponent of David who stoned and cursed the deposed king as he journeyed eastward from Jerusalem to escape from Avshalom. David concludes his prayer by referring to himself as an "Ani Ve'evyon" – a poor, indigent man. While this phrase might simply describe his current plight, Mesudat David explains that David speaks here of his sense of absolute submission to the Almighty. Sincere prayer requires that a person genuinely humble himself before his Creator and recognize his complete dependence on God's assistance. David therefore emphasizes his humble submission to God's authority and asks that in this merit he should be granted assistance during his current crisis.